The Mineral Point Kiwanis Club honored its December Students of the Month at its meeting Tuesday, December 4 at the Pointer Cafe. 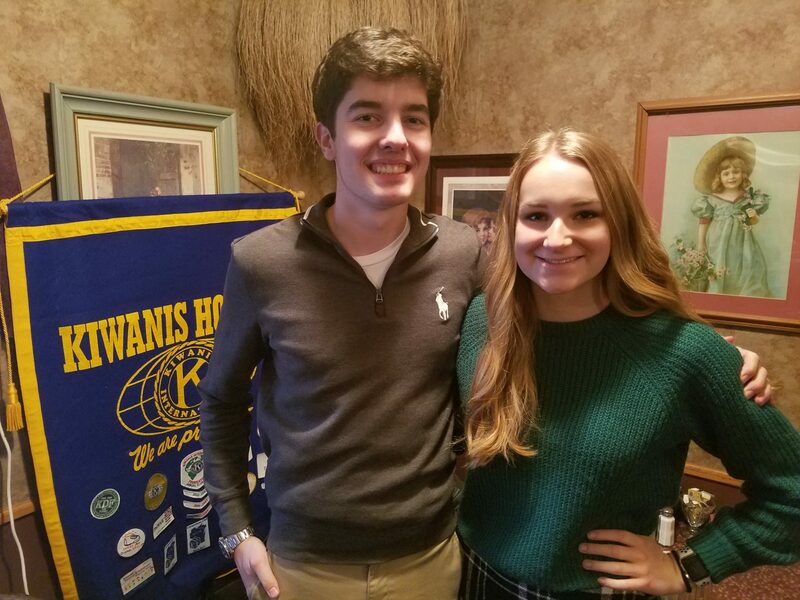 To begin, Maddie is very honored to have been chosen as a student of the month by Kiwanis and would also like to congratulate her classmate Brady Palzkill. Maddie Faull has been a part of the Mineral Point School District since kindergarten, and before that, she lived in Linden and Iowa. She currently lives with her Mom, Kimberly, whom she would like to thank for always being so strong and doing everything for her, and her brother Garrett, whom she has just started to get along with. Alongside them lives two cats and a 100 lb lap dog named Odie. Her dad, Tom, Stepmom, Michelle, and little sister, Alexis, currently reside in Middleton. She would like to thank them for always making her laugh and being there for her. In school, Maddie participates in Mock Trial, which went to state last year for the first time, Math Team, Key Club, Student Government, and is a member of the National Honor Society. She deeply enjoys soccer, so she plays nearly year round with activities like fall club soccer, winter indoor soccer, and high school spring soccer. Maddie feels very fortunate and grateful to be able to play with a team that she loves. In her freetime, Maddie enjoys painting, singing, skiing, hiking, and being around animals, which is why she volunteers at the Iowa County Humane Society. Maddie has a passion for learning and likes to help others feel the same, so she enjoys tutoring middle school math students during RTI. Maddie plans to attend either the University of Wisconsin-Madison or the University of Minnesota-Twin Cities to pursue a degree in the science or engineering field, whether it be chemistry, genetics, biology, or environmental engineering. Depending on her major, she hopes to be either a doctor, an environmental engineer, or a researcher so that she has the ability to make a difference in the world. Finally, Maddie would like to thank all of her teachers, but especially her wonderful science teachers, Mr. Matt Austin and Mr. Tom Steger, for giving her a passion for science. She would also like to thank her math teacher, Mr. Ben McWilliams (or Dub), for making math seem possible. Brady is 18 years old and has lived in Mineral Point for his entire life. He is the son of John and Jennifer Palzkill. Brady is very active in his school and community. He is an officer of Key Club, a member of National Honor Society, Mock Trial, Math Team, and Student Government. He participates in 4-H and FFA and competed at both national livestock judging competitions this year in Louisville and Indianapolis. He also has a passion for music and participates in band as well as musical theatre. In band, he is this year’s drum major, in addition to playing trombone and euphonium. In musical theatre he was the sound tech for all four years of high school. Brady also is a member of both the Dodge-Point soccer team and the Mineral Point golf team. He is involved in his community as a member of the Mineral Point Churches’ Youth Group and is excited to travel to Washington DC over the summer to participate in community service. Brady works both as a calibration technician at BEC Controls Corporation, as well as a cashier at High Street Sweets. He believes both of these jobs teach him necessary life lessons that aren’t always able to be acquired in the classroom. During the school day, Brady enjoys spending time in the math and science wing. His favorite classes are Physics, Calculus, and Computer Science. His proudest achievement this year, so far, is building the championship trebuchet in Physics class, aptly named “The Decepticon.” He enjoys problem solving and the satisfaction that comes with working hard on a complex problem and finding an answer. Following graduation, Brady plans to go to college to study computer engineering at a Big 10 university. Brady has been accepted into the engineering program at the University of Minnesota-Twin Cities but is still awaiting a response from the University of Wisconsin-Madison. His final goal is to be a computer engineer, working to create devices that will be cutting edge for the digital age. He hopes to work for a big tech company such as Google, Amazon, or SpaceX. Brady would like to congratulate Maddie, and his classmates who have and will be recognized with the honor of Student of the Month. He would like to extend thanks to the Mineral Point Kiwanis for recognizing him as the December Student of the Month. He would also like to thank his parents, teachers, community, and peers who have given him unwarranted support and motivation for the past 18 years.